The « AGILE TEAM RADAR » is a self assessment tool I like to propose during sprints retrospective to collect data, especially with teams new to agility. Teams don’t always understand the importance of agile values, and don’t perceive how they are intimately linked to their everyday practices. The necessity and the opportunity to return to foundations again and again! 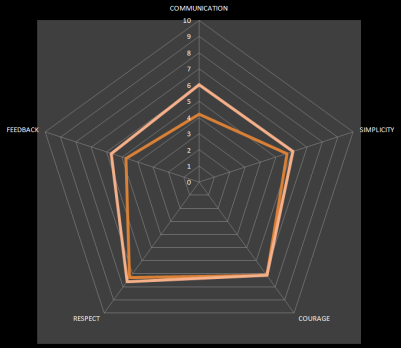 A good way to start: the agile team Radar with its good focus on the core agile (actually XP) values ! Courage: We will tell the truth about progress and estimates. We don’t document excuses for failure because we plan to succeed. We don’t fear anything because no one ever works alone. We will adapt to changes when ever they happen. 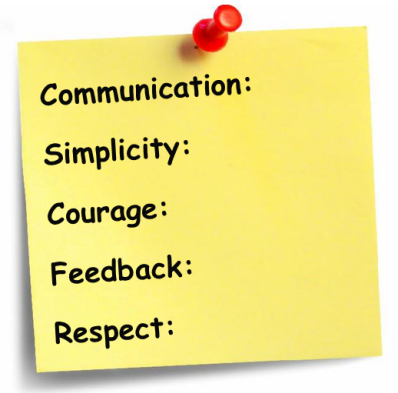 Step 3: Let the team make it real and link these values to their current practices… Let the discussion go ! 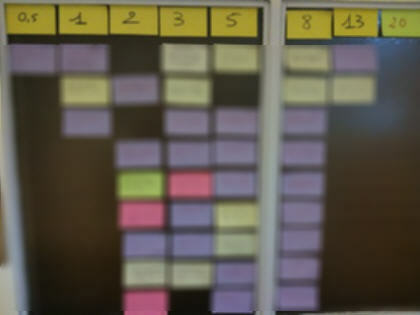 Step 4 : Do the self assessment, anonymously, with a scale of 0-10 : how well the team is doing with the 5 agile values ? Agile Value Card - Rate each value - 0 (not at all) to 10 (as much as possible) - It's anonymous ! Step 6: : Discuss the results and use it to track progress: NEXT SPRINT WE FOCUS ON FEEDBACK ! Sprint 1 vs Sprint 2 : Do you notice the progress ? 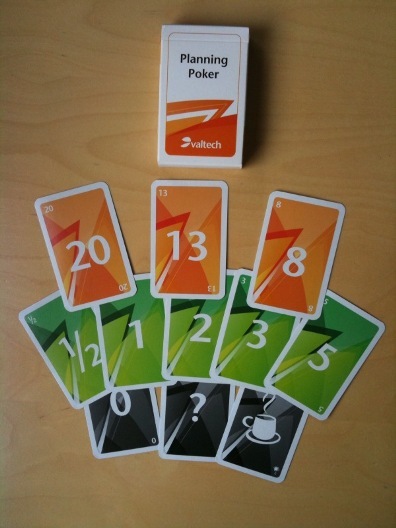 Agile coaching tips: make the planning poker easier and more visual ! One of the first differences observed with Agile is the way we estimate the size and duration of an IT project. The entire team is made responsible for the estimate of the product Backlog (the list of all functionality desired in the product). Indeed, the team is invited to estimate collectively this list of valuable items that will require his work. Scrum teams use Story Points and Planning Poker for this activity. Story Points represent a measurement of the effort required by a team to implement a Story. Collective intelligence is the pillar of this new way to estimate … an effective team-based estimation technique but not so natural at first. Relative size and consensus are not so easy for the teams new to agile. Teams often lose the thread of their estimates. They have difficulty in comparing or lack of benchmarks. Use a visual display of the planning poker values in columns, and place the user stories in the appropriate column during the activity. It reinforces the idea that result is not frozen during the activity: change is easy t! The ScrumMaster IS NOT an Agile Coach ! Agile Coach vs ScrumMaster: it is sometimes a bit blurry … probably because the ScrumMaster acts sometimes as an agile coach, using coaching techniques and probably because the Agile coach is sometimes asked to play the role of ScrumMaster in Scrum projects. Mission High variability. Never the same. A strong clarification of the objectives and a precise analysis of the context are required. Activity – Presence Variable and not continuous depending on the context and needs. Stronger presence at the beginning of the mission, less thereafter. The Coach is looking for the autonomy of his client … Continuous. Throughout the project period. Training Trained in methods, roles and Agile practices. It’s my Vision, what’s yours ?